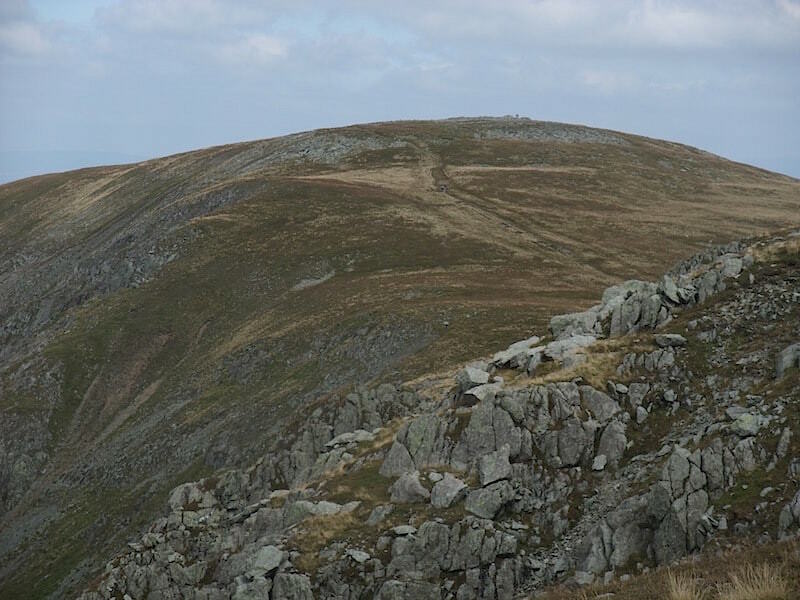 A walk very close to home today, so its just a short drive over to Mardale Head this morning for our outing over some of the far eastern fells. 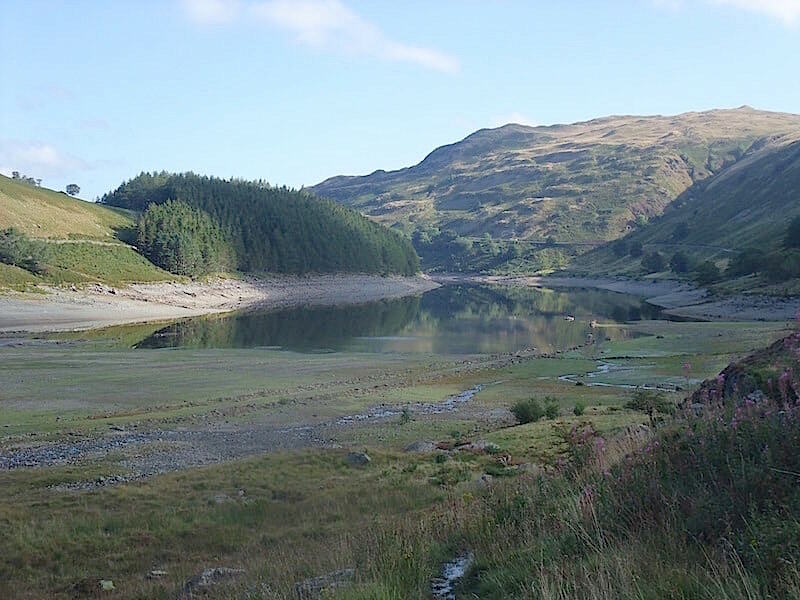 This is a view of Haweswater from the parking area at Mardale Head, note the very low water level. Its an absolutely beautiful morning, let’s hope it lasts. 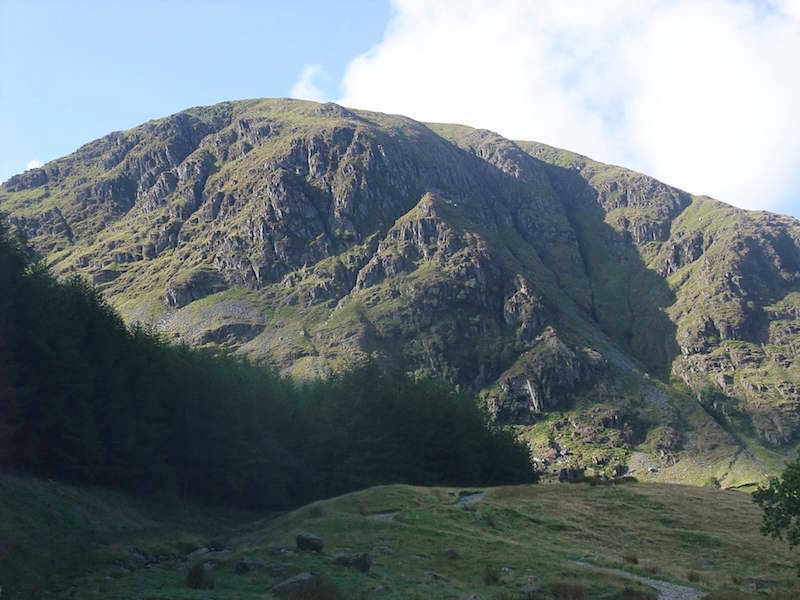 A look over at Mardale Ill Bell standing out in the morning sunshine. 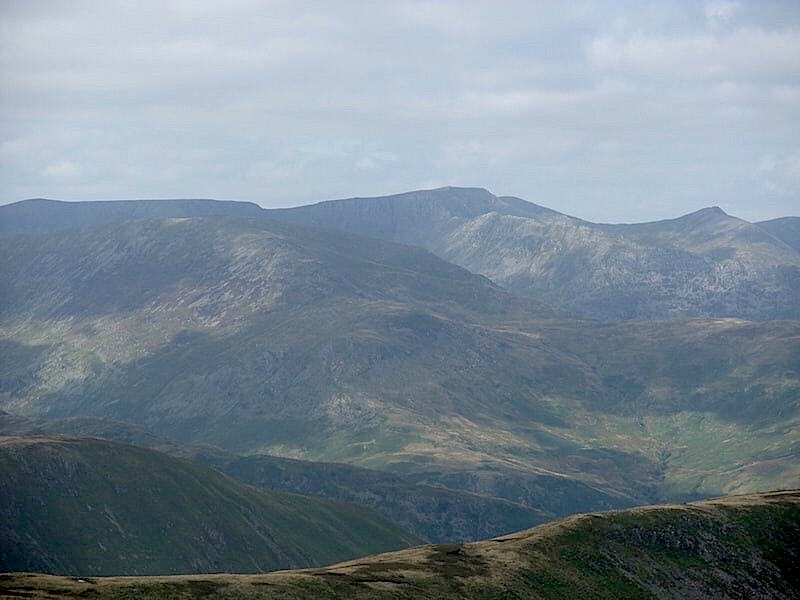 Also catching some sun is Harter Fell, but the cloud is beginning to build. 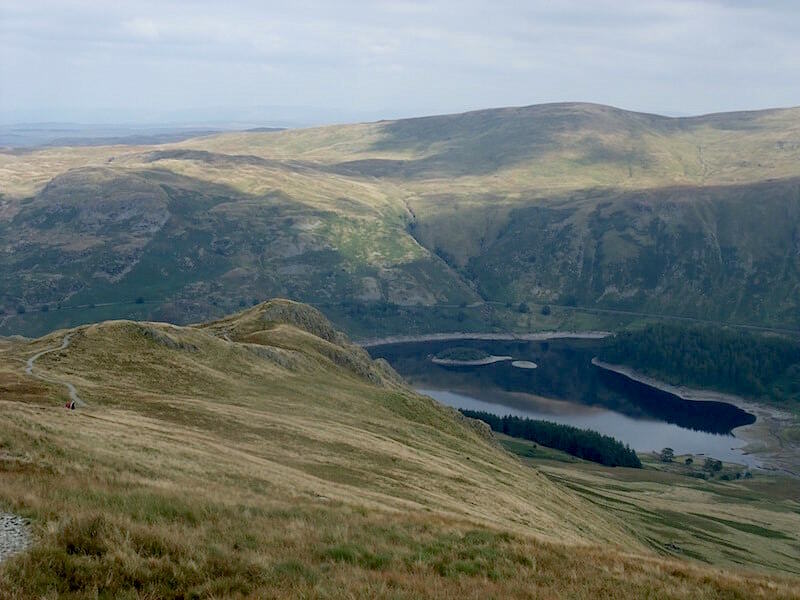 Haweswater from higher up the path. The car park is to the right of the shot, a few cars there at the moment and in the summer months a line of parked cars can stretch all the way back along the road. It pays to get here early. 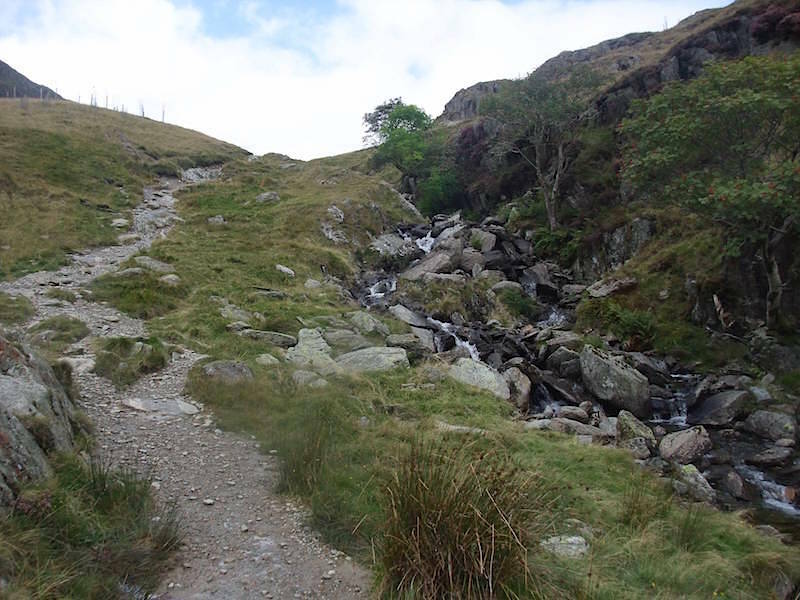 Making our way up to Small Water. 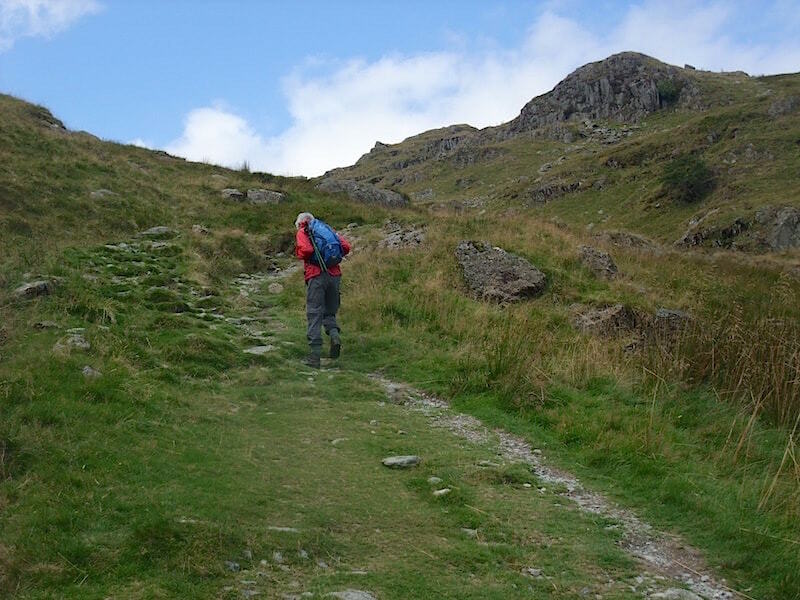 This is a path I always enjoy walking, its not a huge distance from the car park and it isn’t one of those climbs that is steep right from the start. 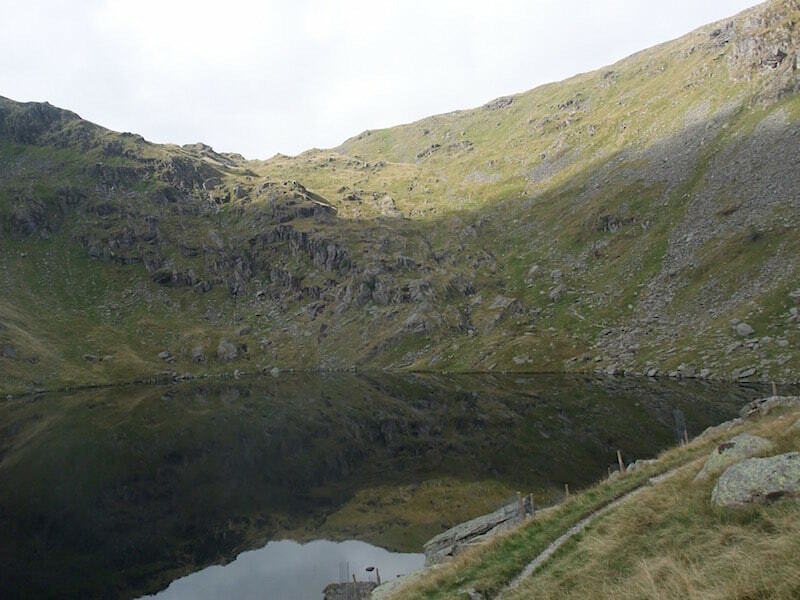 It starts gently enough and rises gradually up to the tarn so the legs get a good chance to warm up. 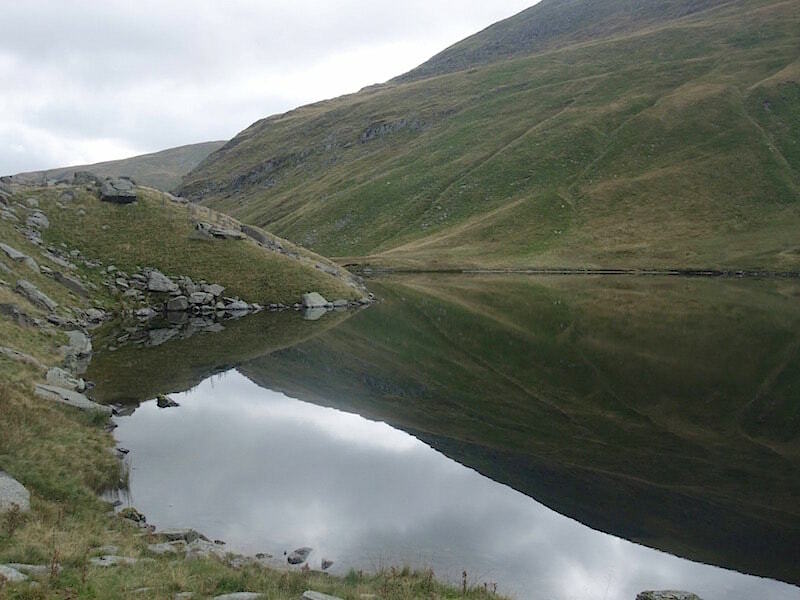 Its also a nice little walk to the tarn and back when the weather closes in and the high fells are blanketed in cloud and rain. 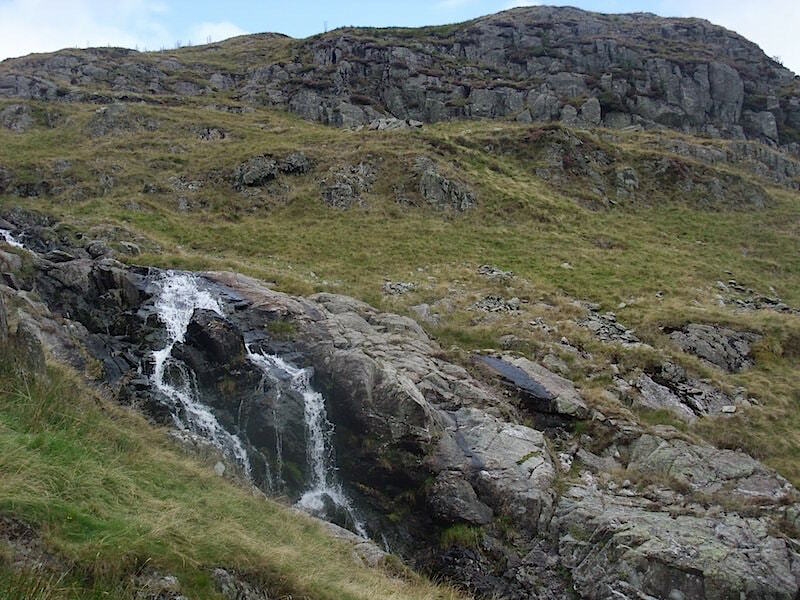 Small Water Beck runs alongside the footpath. 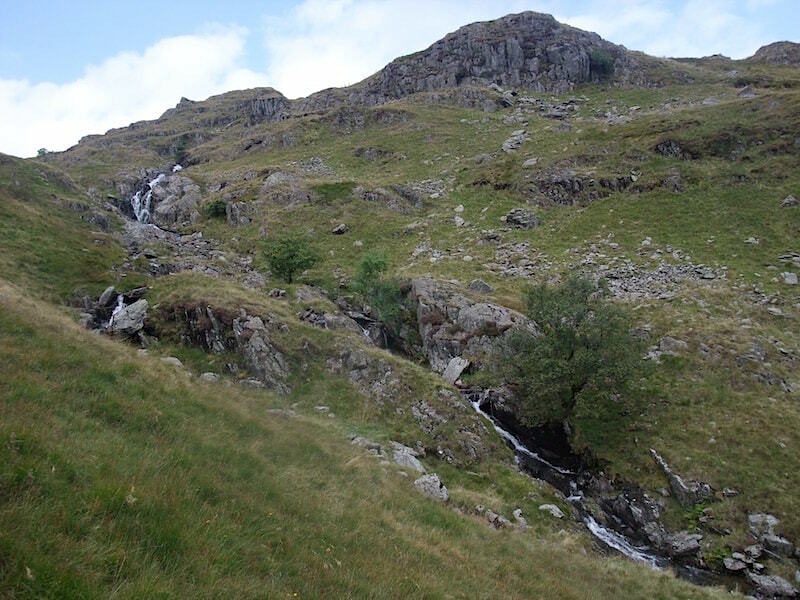 One of the falls in Small Water Beck, not a lot of water running down today as its been so dry lately. 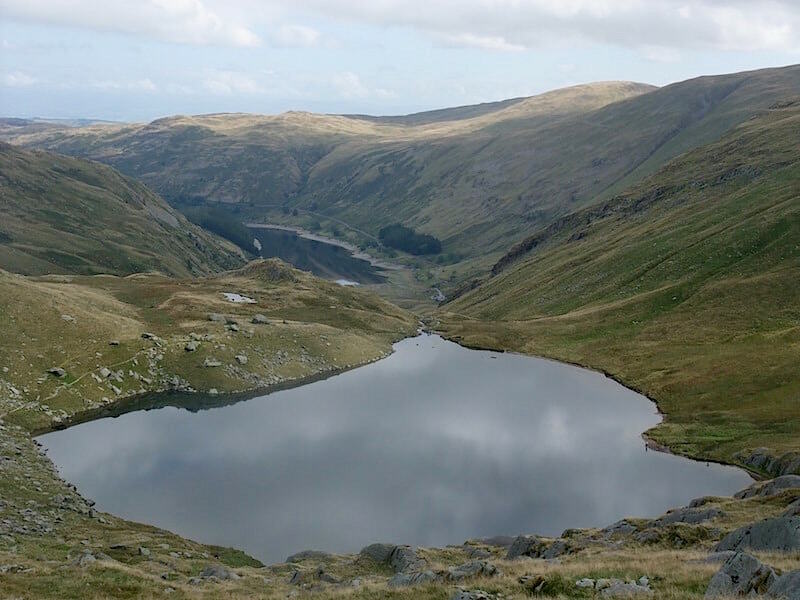 We’re almost at Small Water tarn …..
….. so I take a look back down before we lose the view for a while. 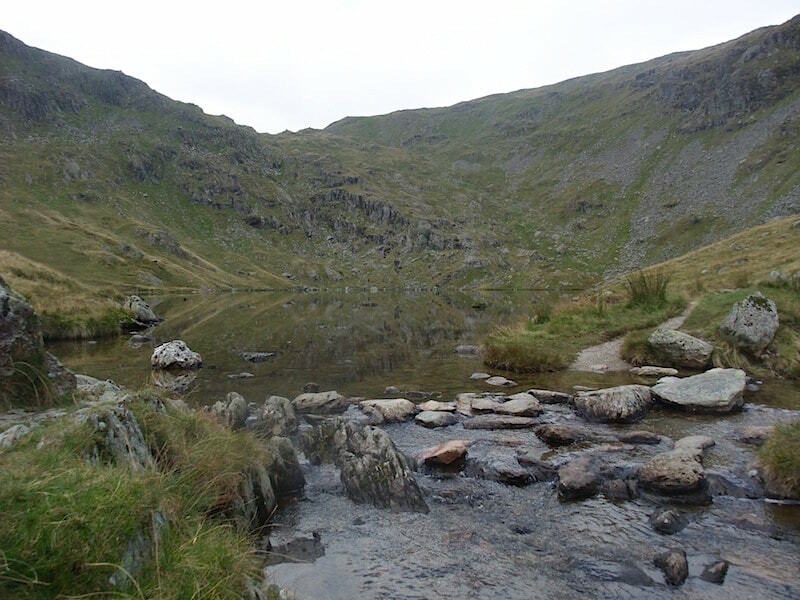 The outflow at Small Water tarn. 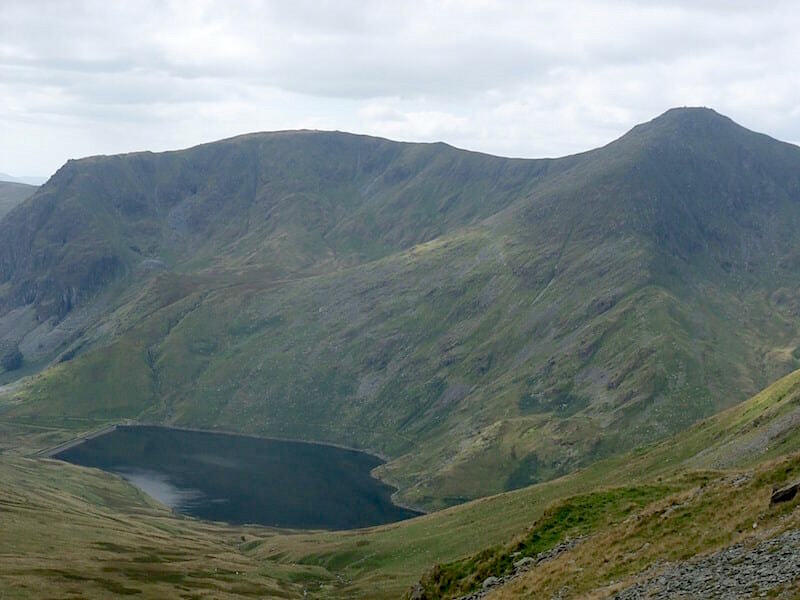 Across from us is the east ridge of Mardale Ill Bell, and a walk over there is on the ‘to do’ list. 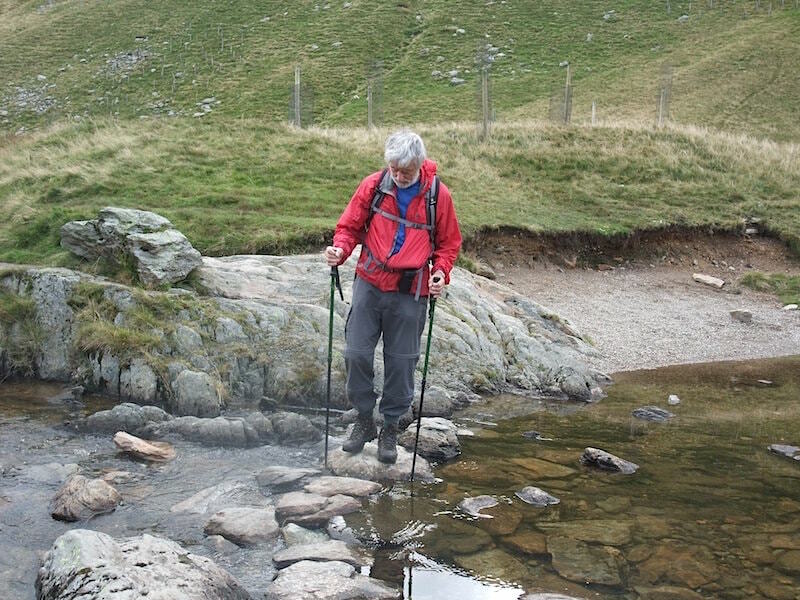 Crossing the outflow stepping stones. I usually manage to find the one that wobbles. 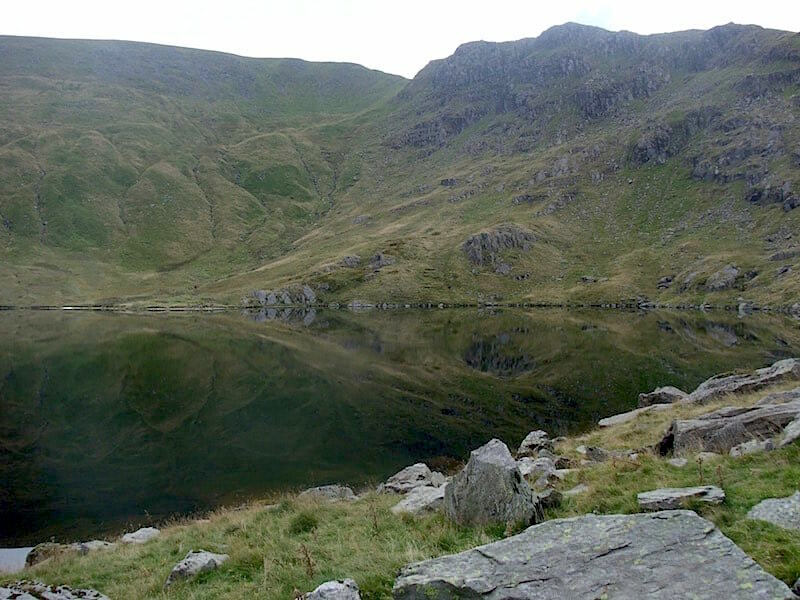 Small Water Crag on the opposite side of the tarn. I don’t know where the occupants of all the cars are but they certainly weren’t up here, there was nobody here at all except us. 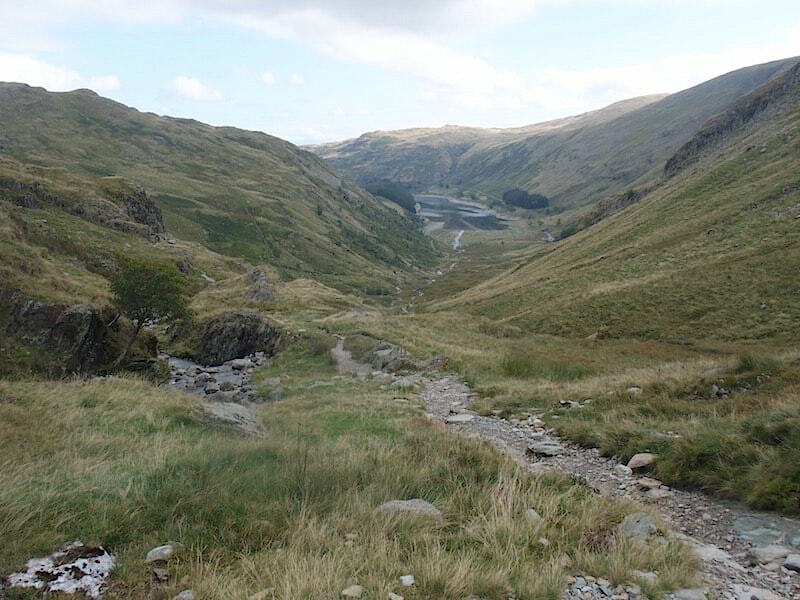 From the outflow we follow the path around the tarn which will eventually lead us up the Nan Bield Pass to the low point on the skyline. 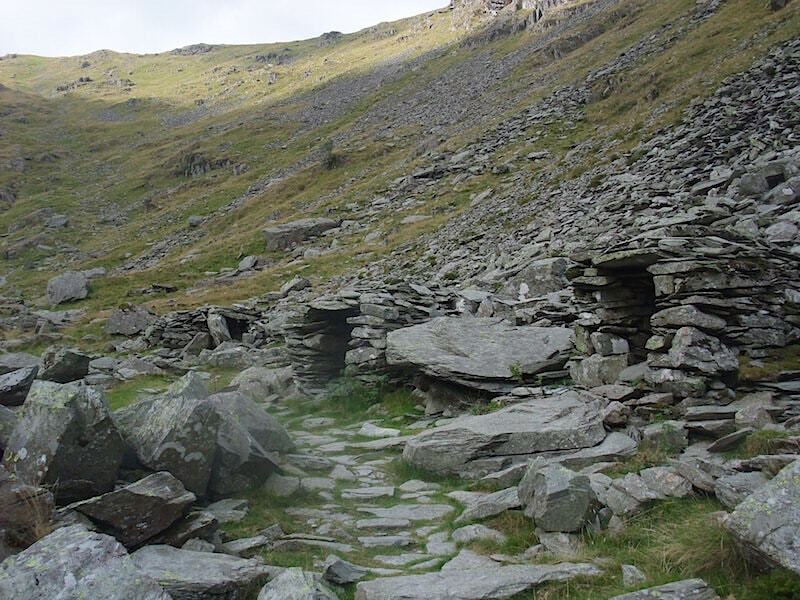 The path alongside the tarn passes these old stone shelters, who used them originally I have no idea, shepherds, drovers, quarrymen? The shelters are very small and I wasn’t tempted to try getting inside one, although I suppose you might be glad of one if circumstances were dire enough. A mirror finish on Small Water. 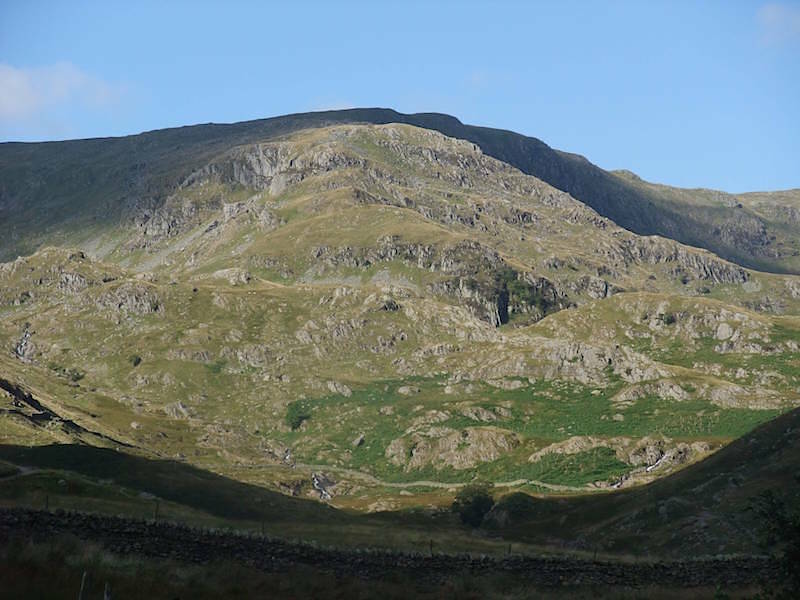 Small Water Crag on the right with Harter Fell to the left. 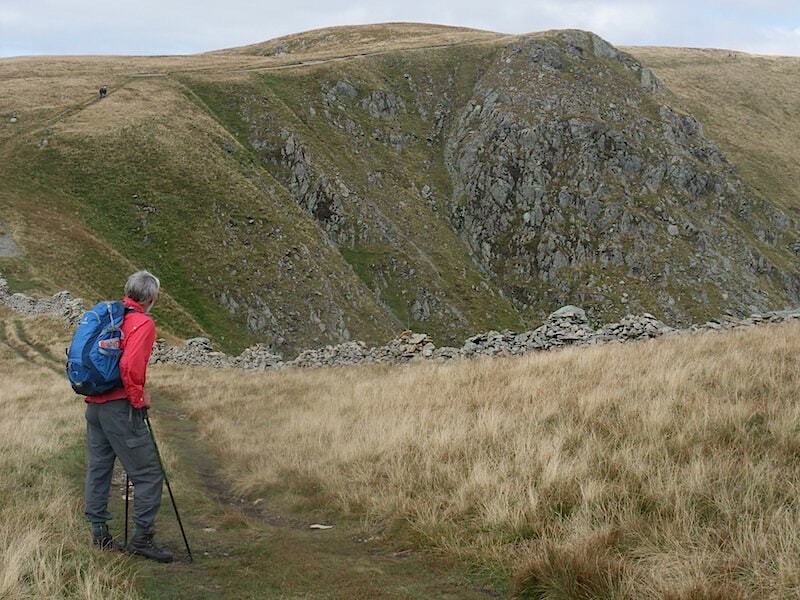 We’re gaining height steadily as we walk along the Nan Bield Pass. 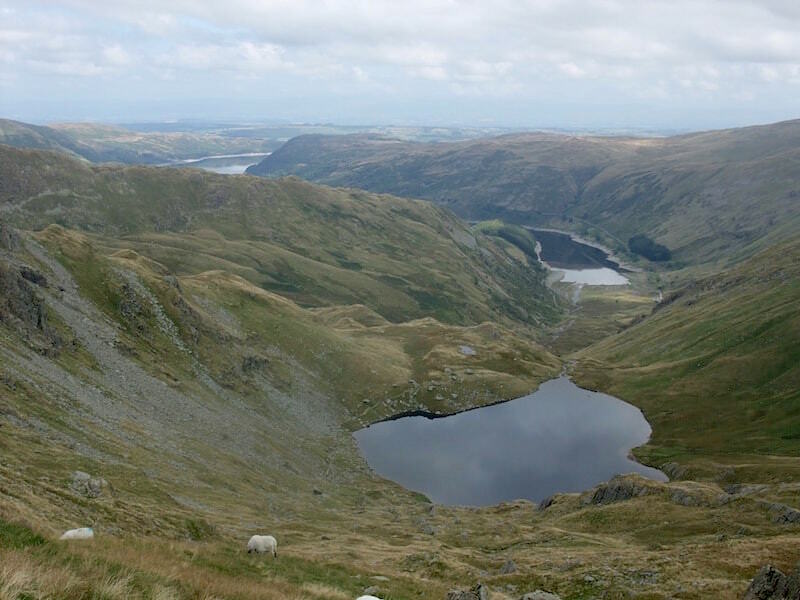 Below us is Small Water with Haweswater below that. A stop to remove a layer. 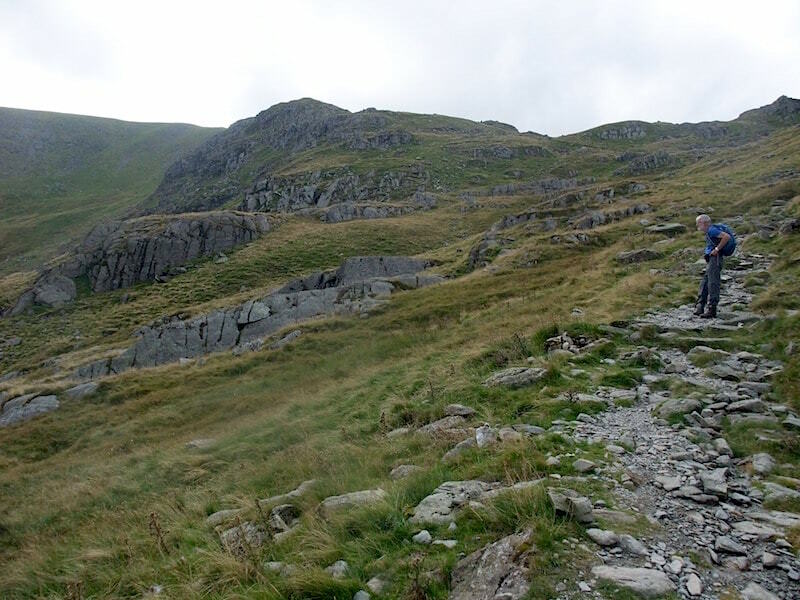 The sunshine has mostly been replaced by cloud and it became quite warm and muggy on the walk up here. 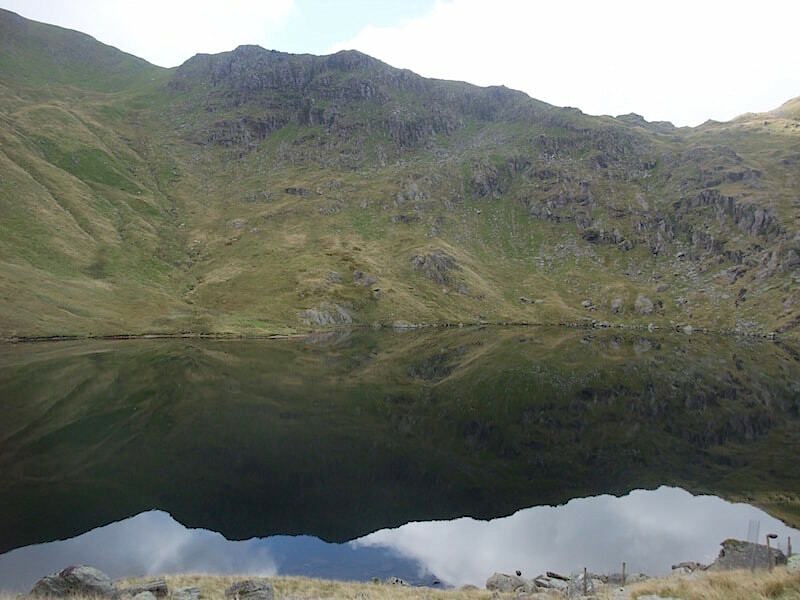 A large water, a Small Water and a tarn. Patches of sunlight here and there between the cloud, where did that beautiful morning go? We’ve almost reached the top of the pass. 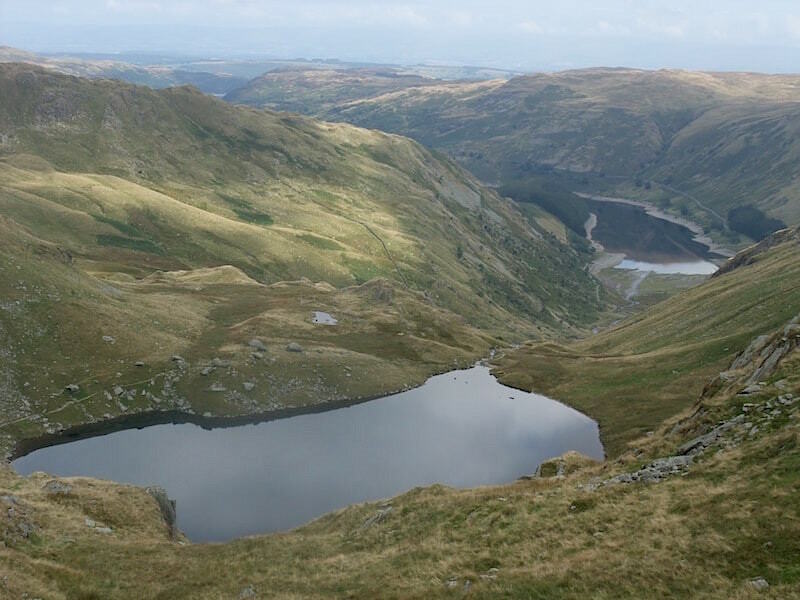 Kentmere reservoir below Yoke and Ill Bell from the Nan Bield crossing point. 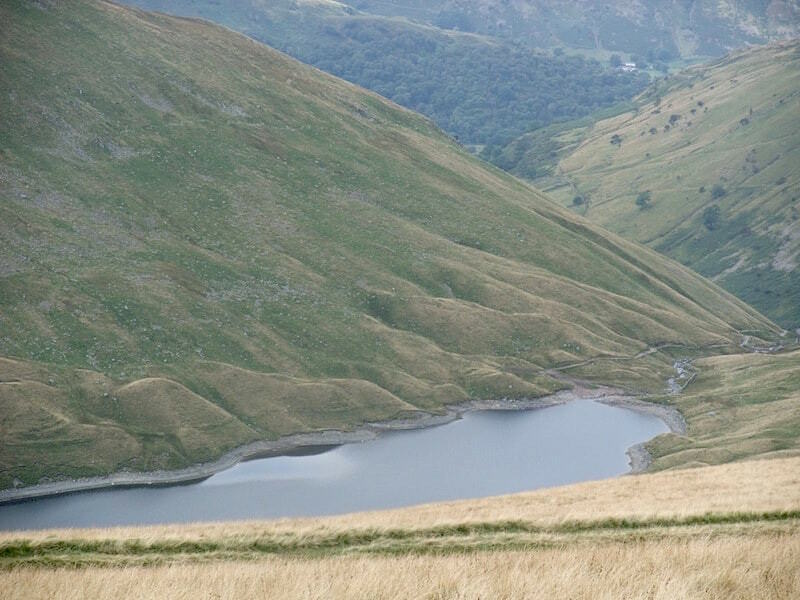 The reservoir was created in 1848 and the water from it was used to power various mills (paper, wood, gunpowder and snuff being some of them) in the Kentmere valley and at nearby Staveley. Apparently it is now owned by the James Cropper Paper Mill at Burneside, Kendal. 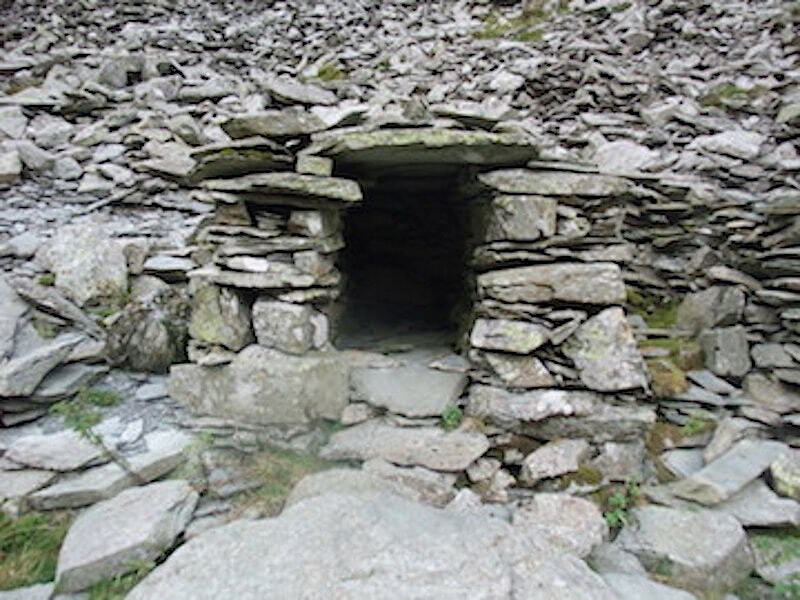 The shelter at the crossing point of Nan Bield Pass. 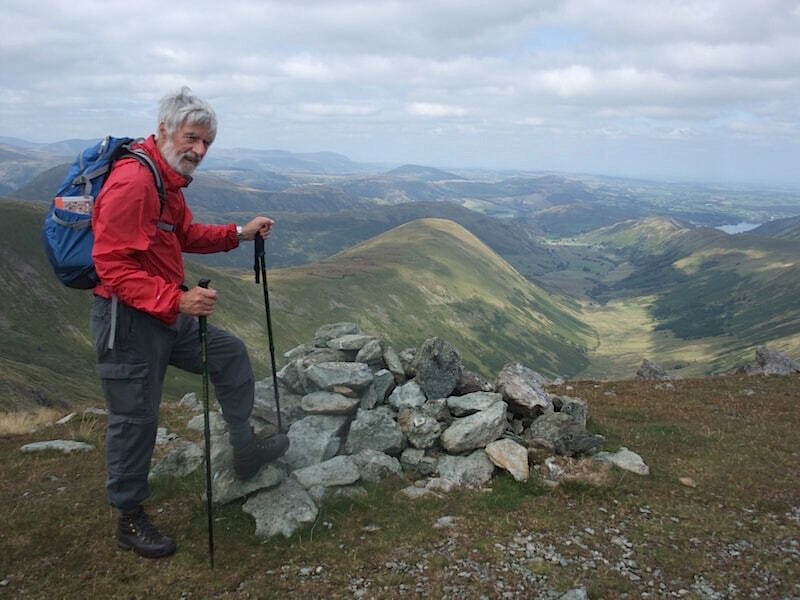 The back of the shelter is set against the prevailing winds and there is some seating inside to we took the opportunity to take a short break …..
…. and admire the view. 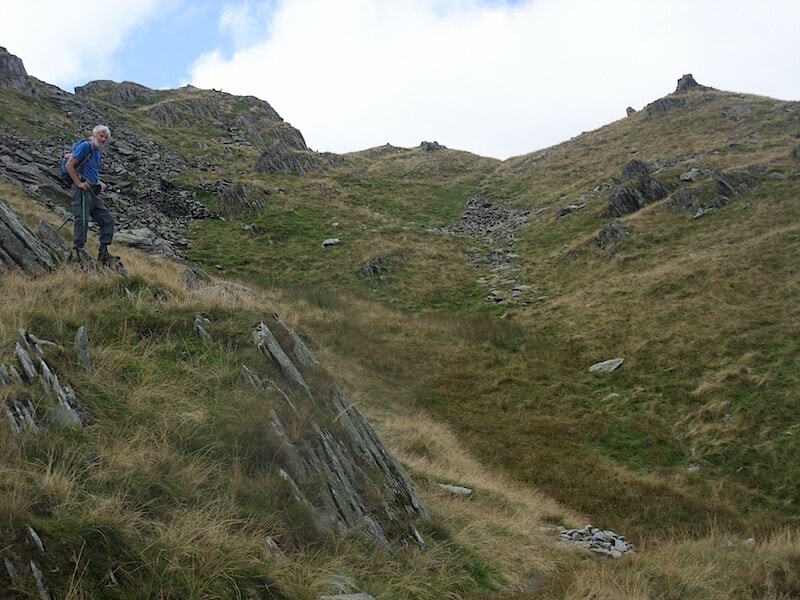 From the shelter we start making our way up to Mardale Ill Bell. 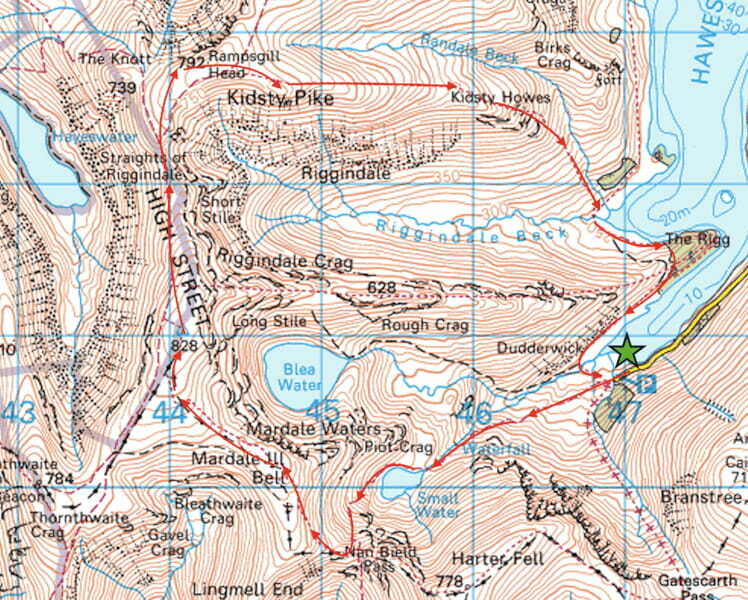 As you can see from the route map it isn’t a huge distance and the path is nicely pitched so there are no difficulties. 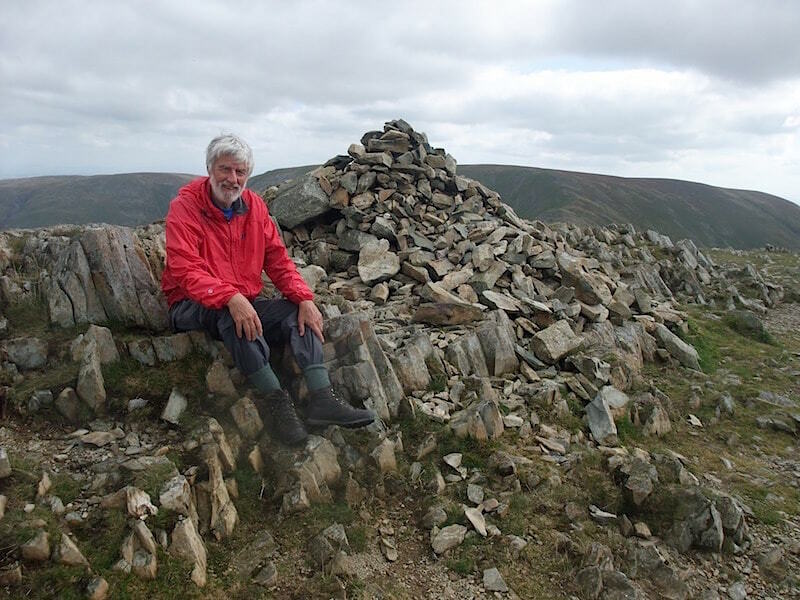 The summit cairn on Mardale Ill Bell. 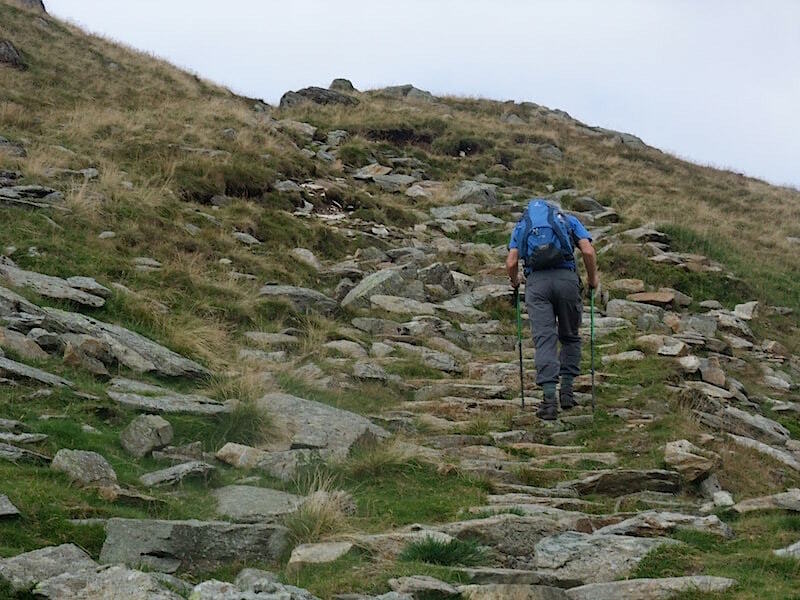 From Mardale Ill Bell we take the path leading over to High Street. The photo is a bit fuzzy, which it shouldn’t be, but its the only one I took so I’ve included it simply to give an idea of the type of terrain and not for its technical quality. 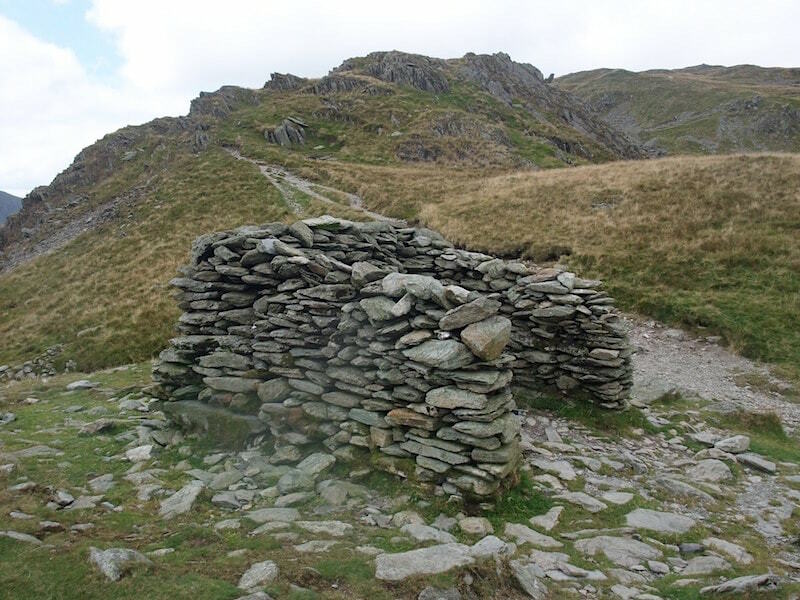 Sheepfold on High Street. Why haven’t I noticed this on previous walks across here? 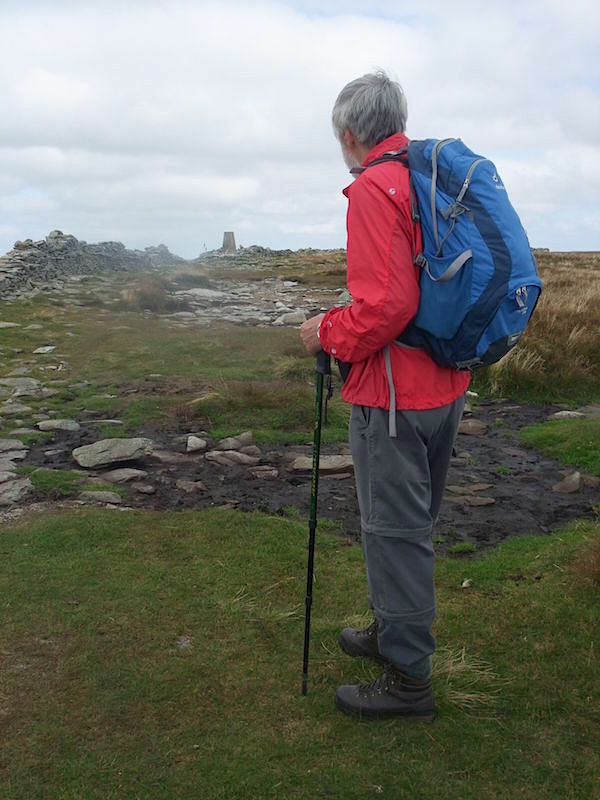 Nearing the trig point on High Street. 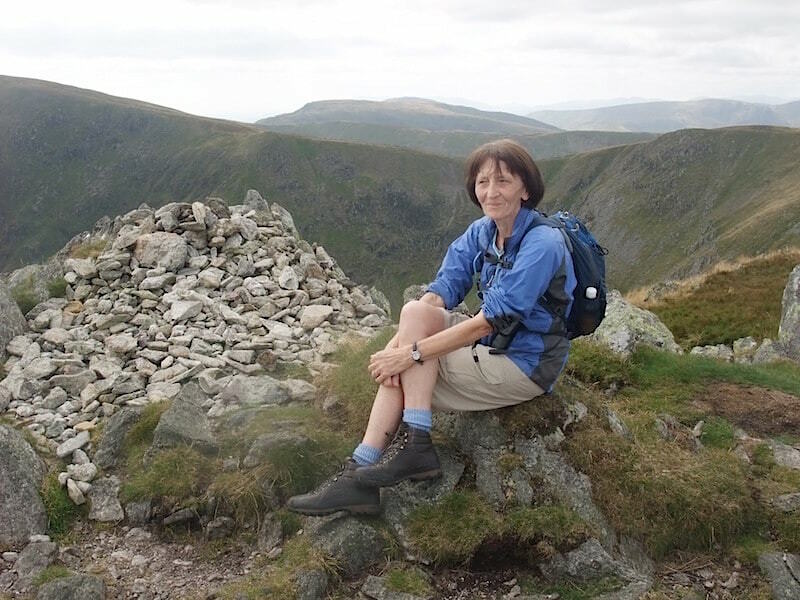 Walking over here is a joy, its the highest of the far eastern fells so the views are great and it has a lovely long plateau so its easy on the legs. 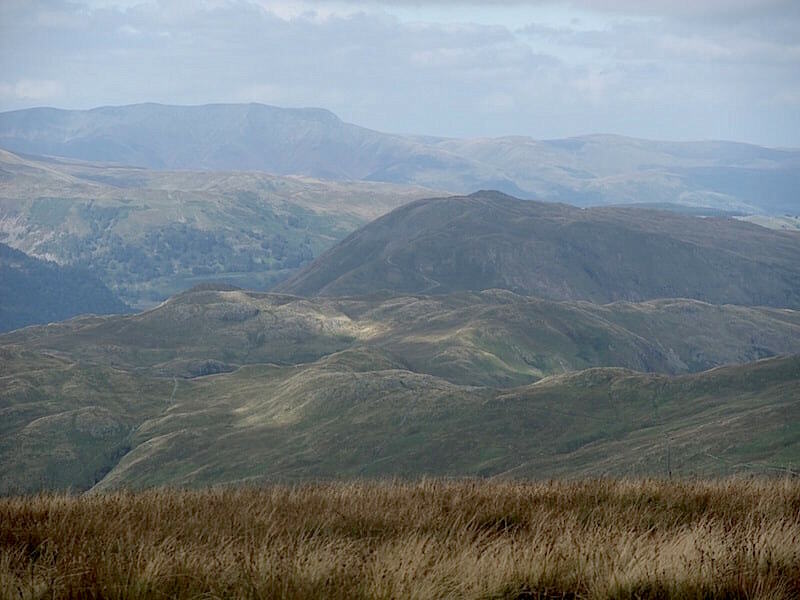 The Romans built a road across it linking all their forts from Brougham, near Penrith, all the way down to Ambleside. 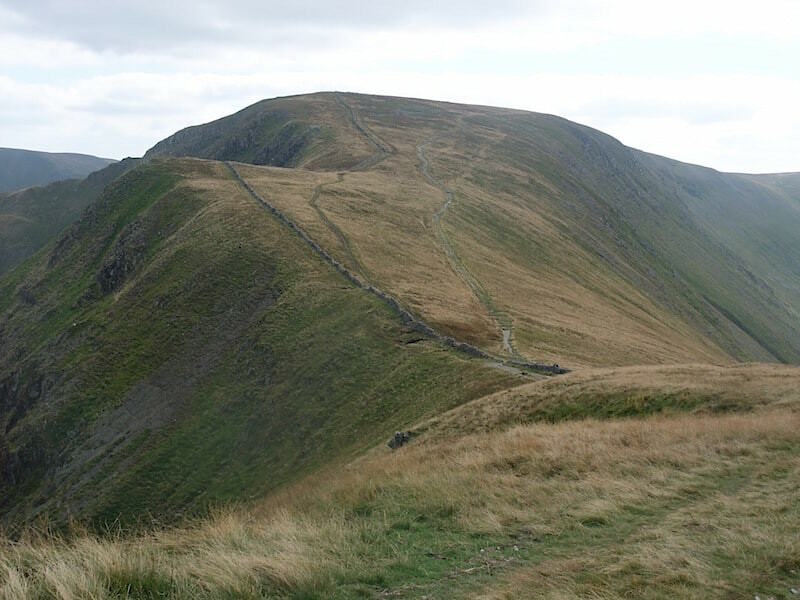 In the 18th and 19th centuries summer gatherings were held up here, one of the activities being horse racing, the summit is often referred to as Racecourse Hill. 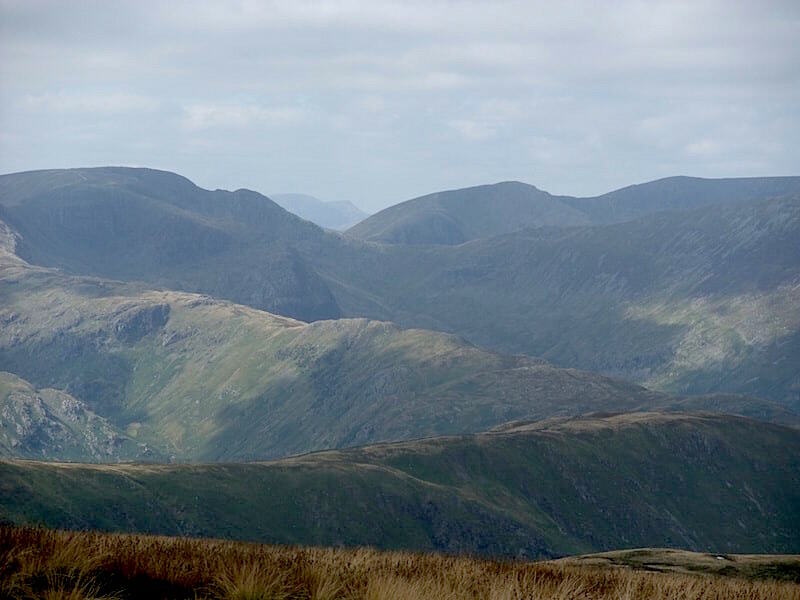 Long distance views were a bit hazy by now but here are a few shots which show the extent of the views …..
On the skyline from left to right are Fairfield, Dollywaggon Pike and Nethermost Pike …..
….. moving a little to the right we have Nethermost Pike again, then Helvellyn and Catstycam …..
….. further to the right we have Raise, Stybarrow Dodd and then Great Dodd …..
….. and further round still are Blencathra, Bannerdale Crags, Bowscale Fell and High Pike. 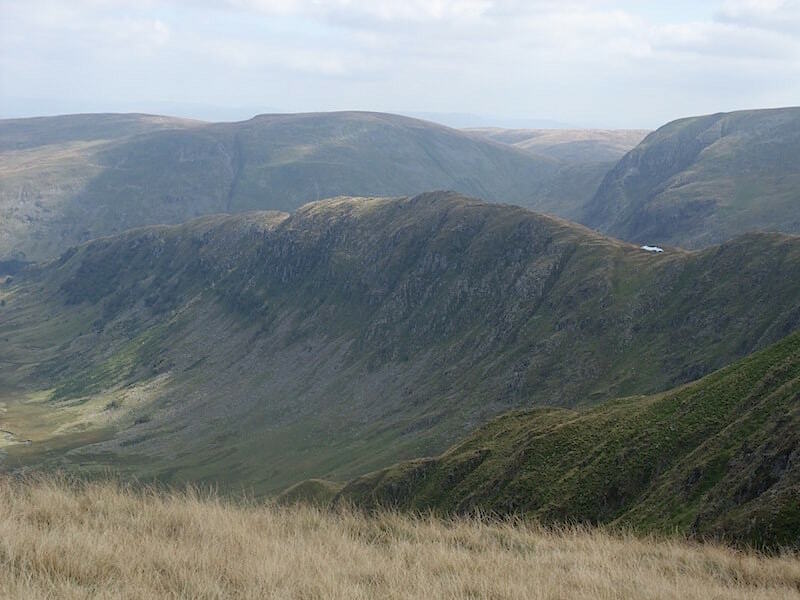 Moving to the west of High Street gives a view down to Hayeswater. 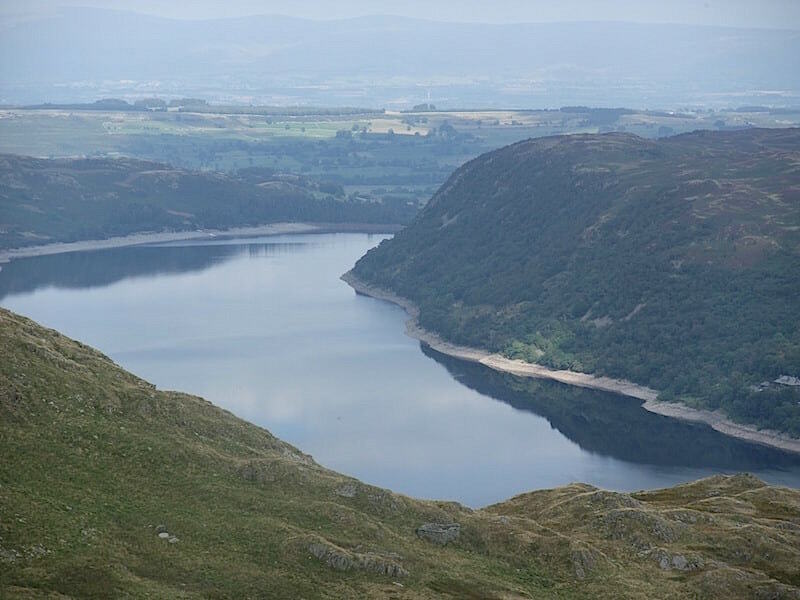 It became a reservoir in 1908 when it was dammed to provide supplies to the communities around Ullswater. 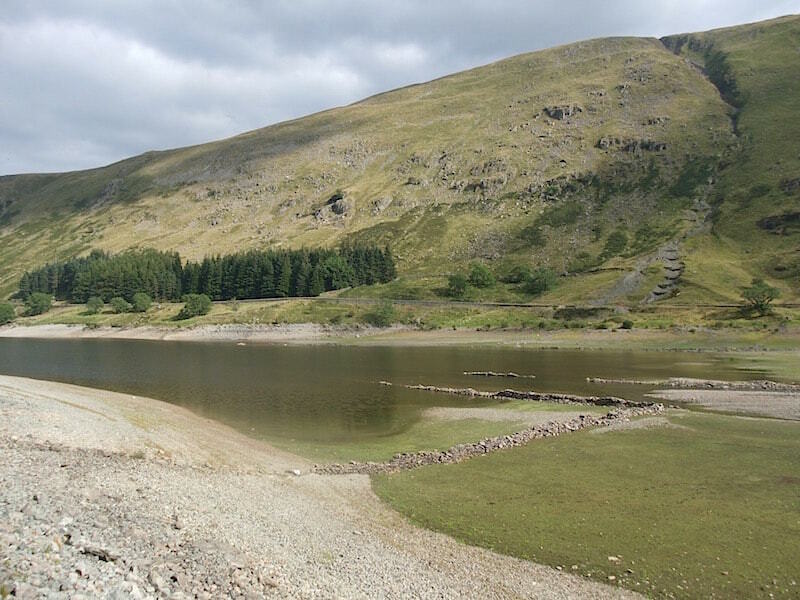 It hadn’t been used for that purpose since 2005 so United Utilities removed the dam earlier this year and the water now flows naturally down Hayeswater gill. It used to be fun to walk across the dam wall and crossing over a wooden bridge lower down the gill isn’t quite the same somehow. 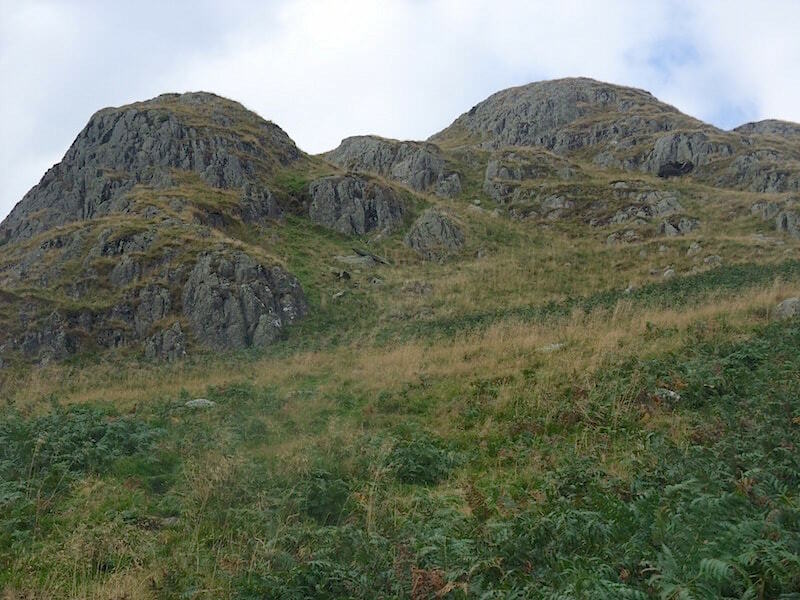 Looking over at Twopenny Crag as we drop down from High Street. 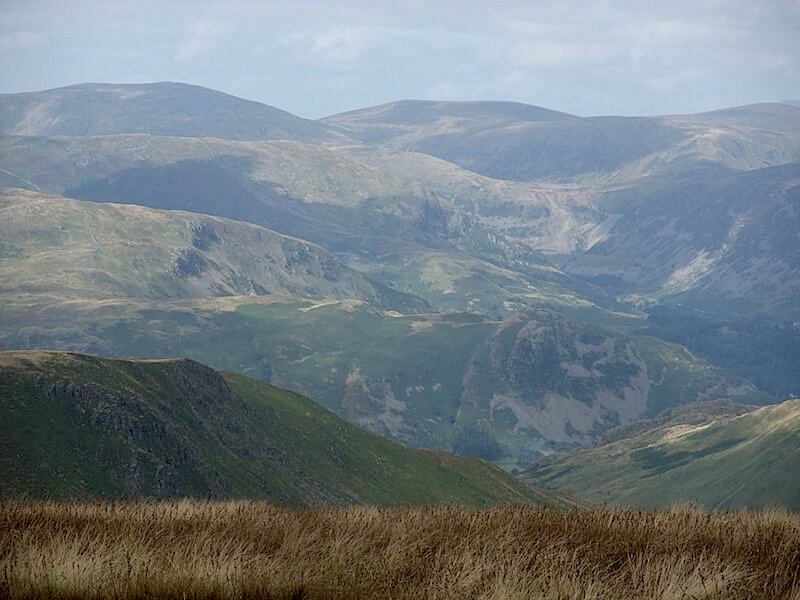 As we make our way over to Rampsgill Head I take a look across Riggindale to Caspel Gate Tarn with Harter Fell beyond and Mardale Ill Bell to the right. 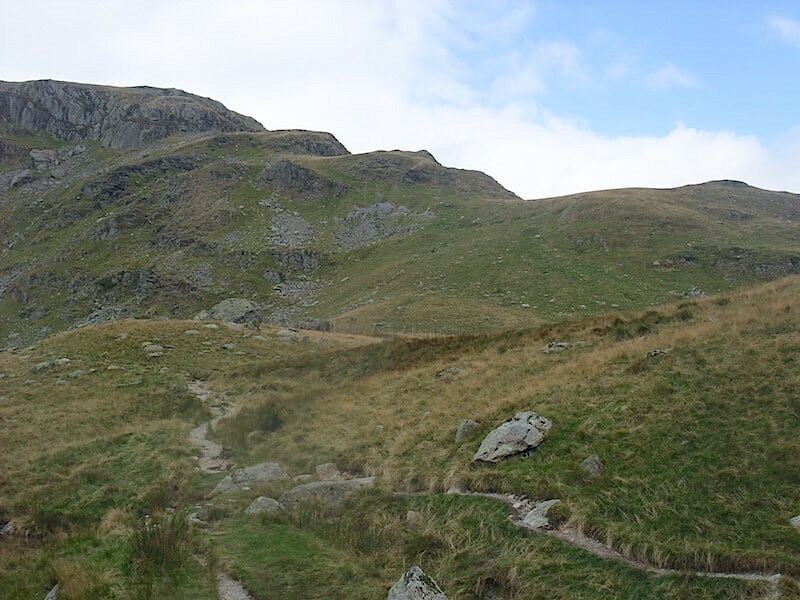 A look back at our route off High Street …..
….. and a look forward to Kidsty Pike. 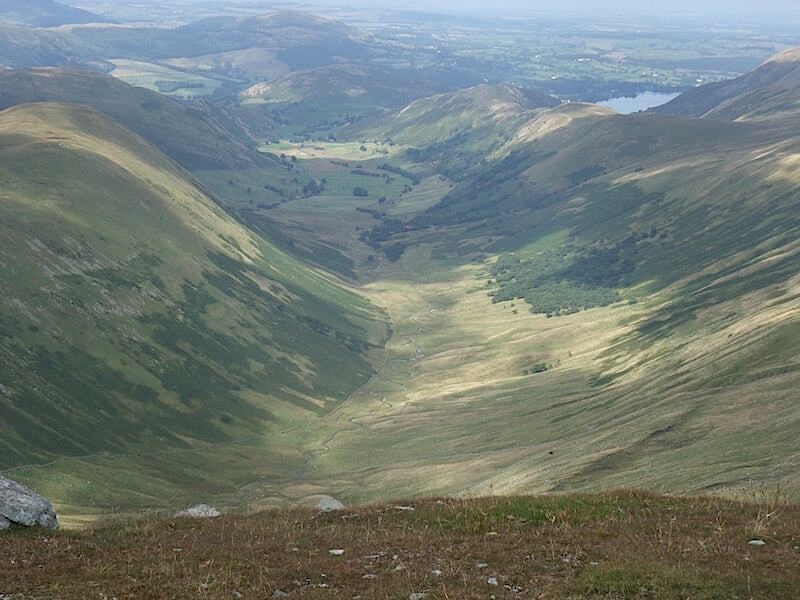 The view down Ramps Gill from Rampsgill Head. From the same spot a look across to The Nab, that brownish patch in the middle of it is a soggy mass of peat hags. 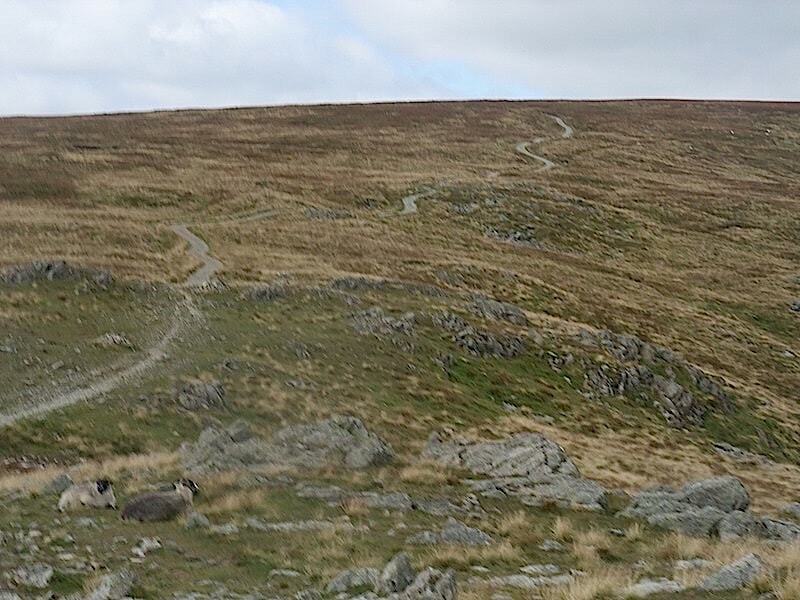 Also from Rampsgill Head a look over at the path to High Raise, not on our agenda for today though. 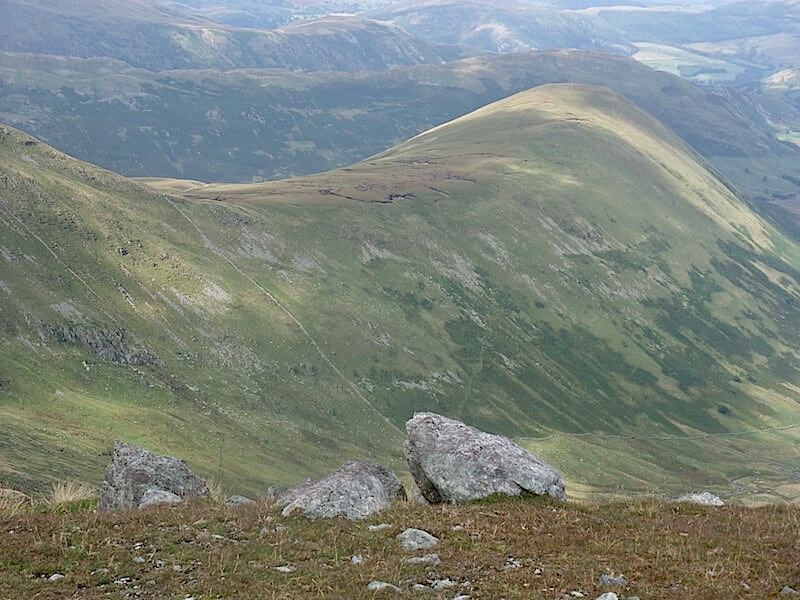 Rampsgill Head summit cairn and the view beyond. 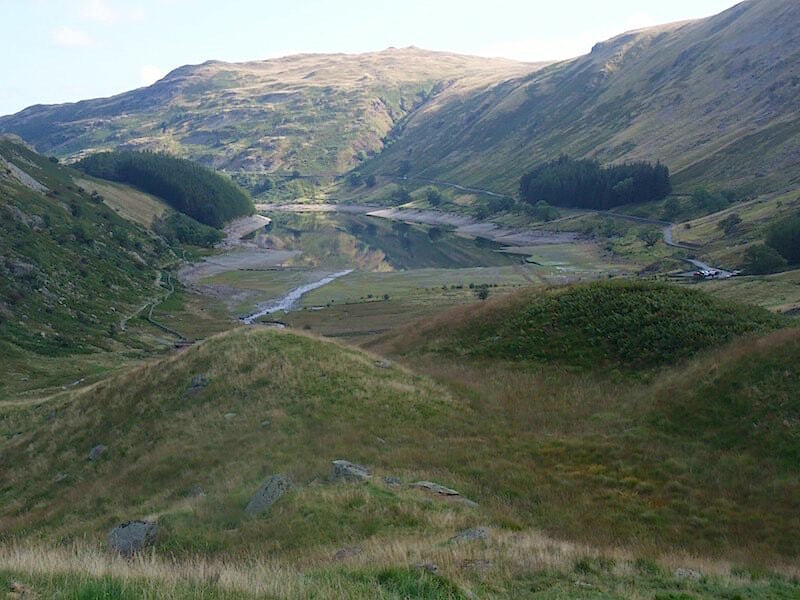 The view of Riggindale and Haweswater as we make our way to Kidsty Pike. 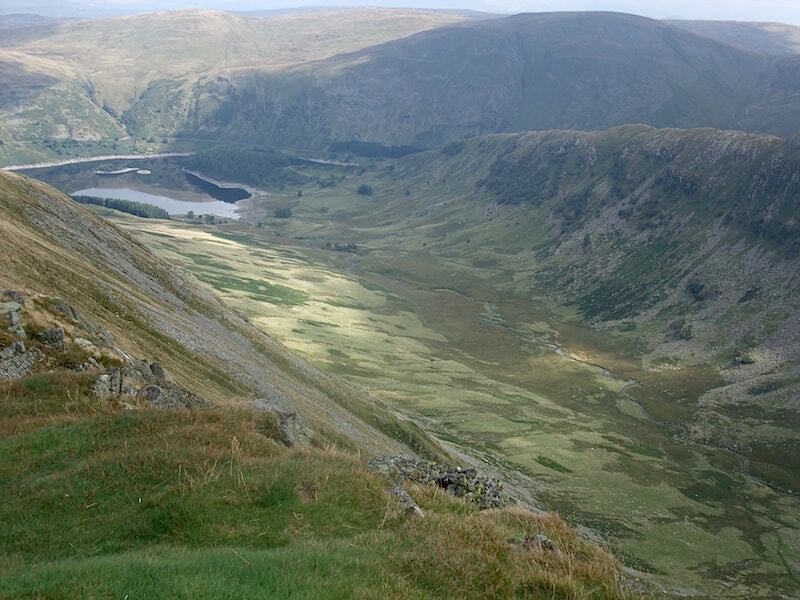 From Kidsty Pike we start the return leg by following the path to Kidsty Howes, the rocky outcrop below us, with Haweswater below. On the way down we met a very weary looking lady who said to us “Please tell me that’s the top up there behind you.” I did wonder if she had thought originally that Kidsty Howes down there was the summit, only to see that it wasn’t when she reached the top, and that she didn’t want to experience that ‘false summit’ feeling again. She wasn’t walking alone but her male companion, who we had passed a good few minutes previously, was a long way ahead of her. I think she said something about him but I didn’t quite catch what it was, although from her tone of voice it didn’t sound like a compliment. 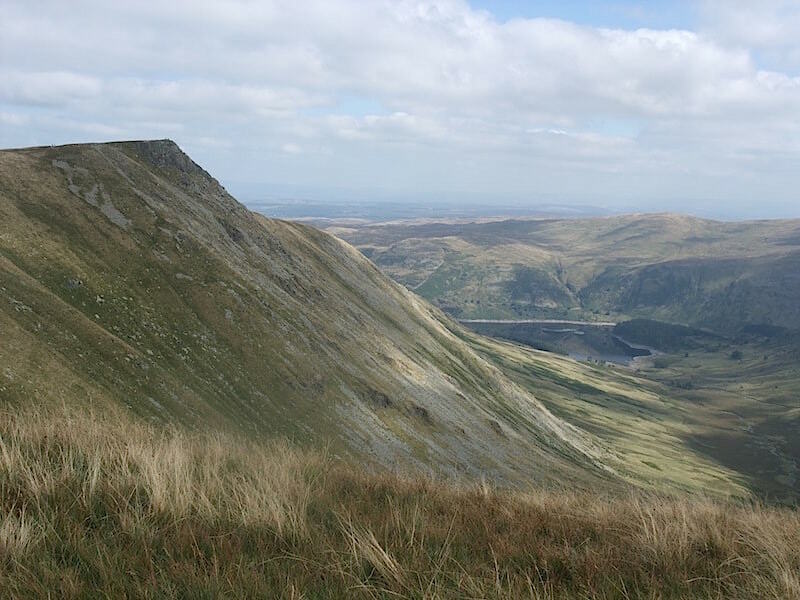 A view of Haweswater on the way down. 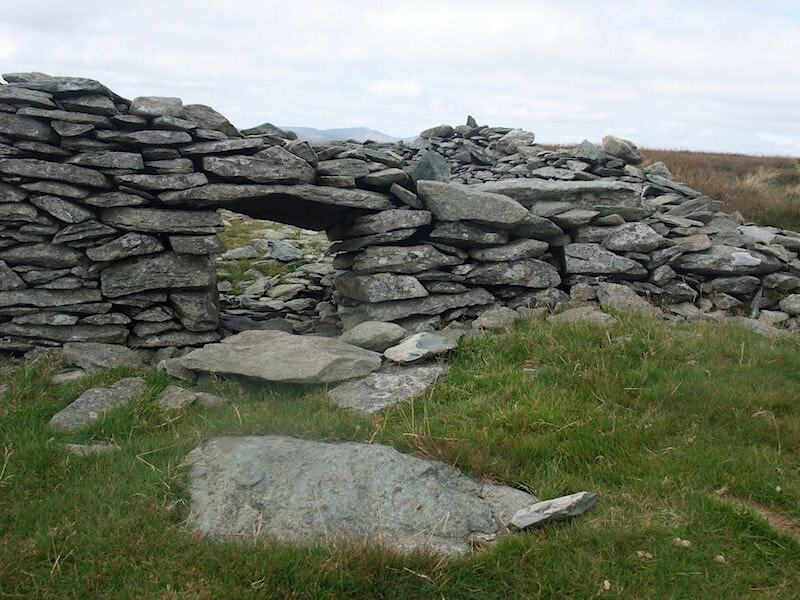 A look back at the rocky area of Kidsty Howes. This is what the lady mentioned previously had already climbed up, only to find that when she reached the top there was a whole lot more ‘up’ still to go. It can be quite a bit of a ‘downer’ if you’re not prepared for it. Life is full of ups and downs though, isn’t it? 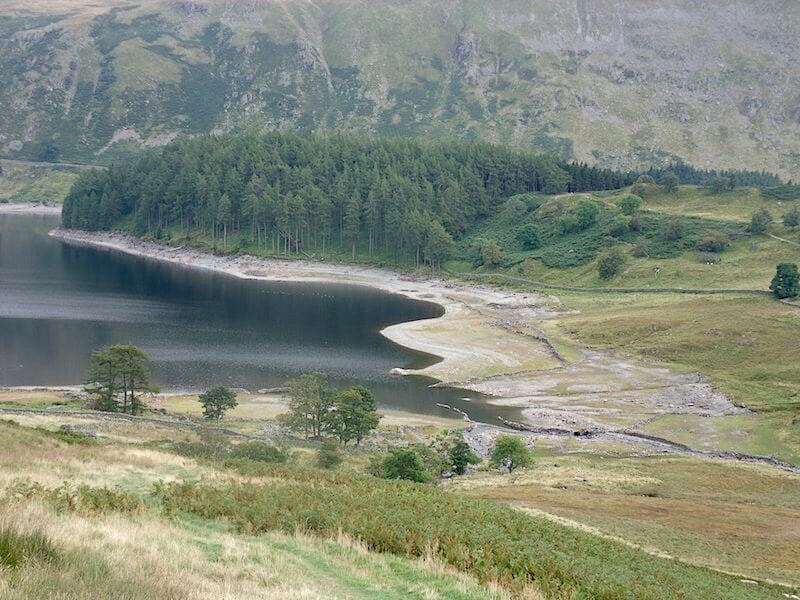 The water level in Haweswater is very low after a dry summer. 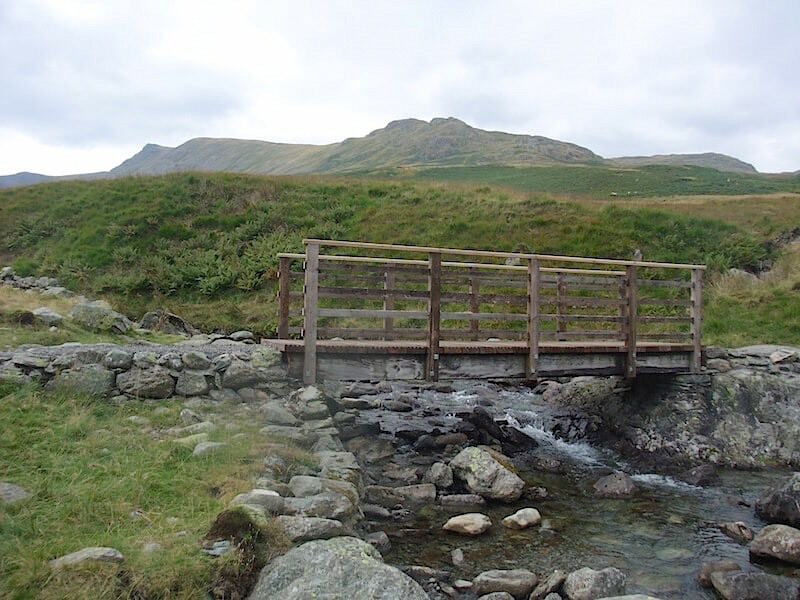 The footbridge across Riggindale Beck with Kidsty Howes on the right and Kidsty Pike over on the left. Back at ground level again and all this should be covered by water. After a dry summer the population of Manchester is using it more quickly than the becks can replenish it. Hope there’s enough in the taps for a cup of tea when we get home.